Are you reading Nail It! online yet? In addition to the magazine, published every other month, the Nail It! website provides you with more nail art, nail news, interviews and all over nail goodness. 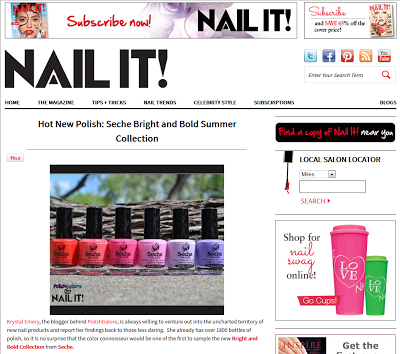 Currently, I have an article up about the Summer 2013 Seche lacquer collection Bright and Bold. You'll be able to see each shade in its glory and coming soon to PolishGalore, I'll go more in depth about each polish but I can tell you, these were very opaque and highly pigmented. You can pick up Seche lacquers at Ulta.com and coming this fall, they will be carrying the entire core line - that's 58 shades! Plus the seasonal collections, and they have some fantastic ones planned. This collection can be found at beauty supply stores around the country and some e-tailer websites like Head2Toe Beauty. Again, go check out my article now on Nail It! Nice! Looking forward to seeing you try one of these. They will finally be posted soon!